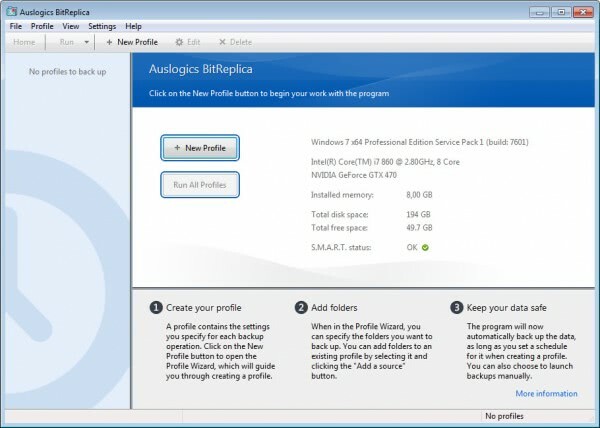 If you are looking for an easy to use PC file backup software then Auslogics' free BitReplica software might be worth a closer look. Each backup operation that you configure consists of three steps. The creation of a profile, the selection of folders that you want to backup, and then the selection of the storage location for the backup. When you first start the program you will notice that the program displays various useful information about the system, including the primary hard drive's S.M.A.R.T. status on the frontpage. Later on you will find all created backup profiles listed here as well. What defines which folders and files you want to backup on your PC. A list of popular locations and items are displayed right on the screen. This includes the user's special folders like My Documents, but also web browsing and email client profile directories. These can be selected with a single click, and are listed with their location and total size. It is naturally possible to select custom folders for backup as well. Where defines where the backup will be stored in. The backup software displays all connected hard drives. If you are not sure where to best store it, click on the suggestion link on the page to have the program suggest the most suitable location. The program only supports connected hard drives, and not remote locations via ftp, sftp or other protocols. How lets you select one of five available backup up methods. From simple copying the files to the destination and overwritting previous backups, to syncing, incremental and differential backups. When configures if backups are performed manually or on schedule. Advanced finally lets you exclude files, configure applications that you want to run before or after the backup, and configure advanced backup settings like a file verification test. Once you have configured the backup profile you will see it listed on the frontpage. Here you have then the option to run individual backups or all backups at once. It is naturally possible to edit a profile at any time. Other options available here include creating a duplicate of a profile, a desktop shortcut to run the backup with a double-click on that shortcut, and options to export or import settings. BitReplica is a file backup software that is easy to use. 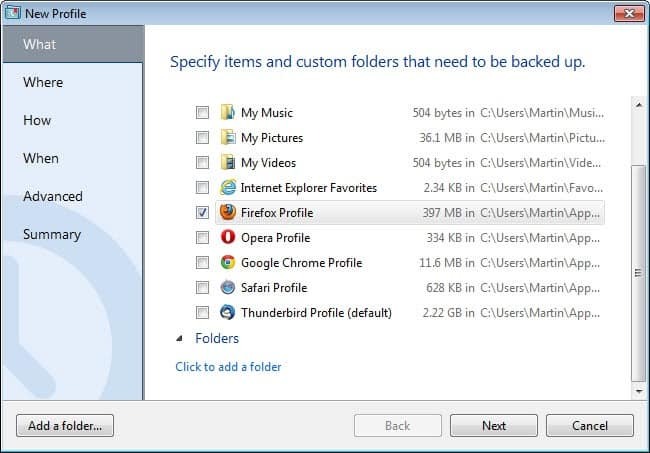 The program does lack several features that some users expect from a backup. This includes options to encrypt and password protect the backups, select remote locations, or create hard drive or partition images. If you are just looking for a file backup though and security is not important, then this one may tick all of your boxes. The software is compatible with all recent 32-bit and 64-bit editions of the Microsoft Windows operating system. The difference between these methods isn’t hard to grasp but there is debate about which is preferable in forums like Tech Republic for instance. Readers might be interested in which method you prefer, Martin, and why. I sure am. Thanks – Daniel. Interesting question. It depends a bit on the situation. If there is need to backup several times a day or even more often than that, then incremental backups are the preferred method simply because they complete faster and use less storage space than differential backups run in the same frequency. If you backup less regularly, say once a week, or maybe even once a day, then differential backups may make as much sense as incremental backups. And since it is usually faster to restore a system from those, many prefer those in this situation. Choose whichever one you want, as it will always be the wrong choice when disaster strikes! Could be, but you can reduce the risk of that happening. It is often not feasible in a home environment though. This is just the 1st public release of this program..so be cautios considering you’ll use it for such an important task .I use his company free portable defrag tool(is quite good i think) ,and i’m sure potential bugs of the file back up will be adressed quickly.. I run incrementals all day and a full backup once a day. This looks good. Might give it a go. Hopefully it’s better than the default windows backup. Not so sure about the reliability of that.